German rabbi; born Dec. 29, 1831, at Verden, Hanover; died at Mayence April 14, 1890. After graduating from the gymnasium, he studied Hebrew at Halberstadt under Israel Hildesheimer. He then went to Berlin University, and thence to Prague, to continue his theological and secular studies. He was graduated Ph.D. from the University of Halle. In 1853 the congregation of Mayence, when building its new temple, provided for the introduction of an organ. 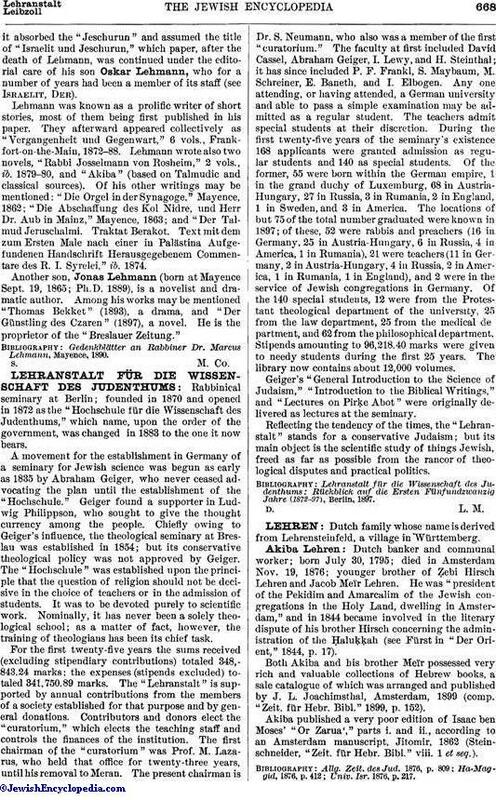 Those of the members who were opposed to this innovation seceded, and organized the Religionsgesellschaft, which in 1854 extended to Lehmann a call as rabbi and preacher. He accepted the position and remained with the congregation until his death. In 1856 he dedicated a new synagogue, which the congregation owed mostly to his efforts (this was replaced in 1879 by the present edifice), and he founded a religious school which in 1859 was developed into a Jewish school where both religious and secular branches were taught. With the establishment of the "Israelit," Lehmann attained a high position as one of the leaders of the movement for the maintenance of Orthodox Judaism in Germany. In 1860 Ludwig Philippson's "Allgemeine Zeitung des Judenthums" was practically the only Jewish periodical exerting a profound influence in extending the ideas of the Reform party. In May of that year the "Israelit" made its appearance, and from the outset it acquired a great reputation and wide circulation. 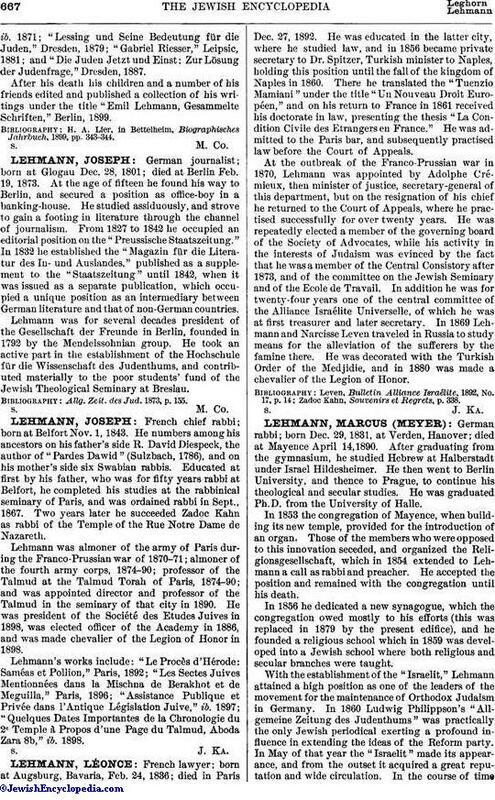 In the course of timeit absorbed the "Jeschurun and assumed the title of "Israelit und Jeschurun," which paper, after the death of Lehmann, was continued under the editorial care of his son Oskar Lehmann, who for a number of years had been a member of its staff (see Israelit, Der). Lehmann was known as a prolific writer of short stories, most of them being first published in his paper. They afterward appeared collectively as "Vergangenheit und Gegenwart," 6 vols., Frankfort-on-the-Main, 1872-88. Lehmann wrote also two novels, "Rabbi Josselmann von Rosheim," 2 vols., ib. 1879-80, and "Akiba" (based on Talmudic and classical sources). Of his other writings may be mentioned: "Die Orgel in der Synagoge, "Mayence, 1862; "Die Abschaffung des Kol Nidre, und Herr Dr. Aub in Mainz," Mayence, 1863; and "Der Talmud Jeruschalmi. Traktat Berakot. Text mit dem zum Ersten Male nach einer in Palästina Aufgefundenen Handschrift Herausgegebenem Commentare des R. I. Syrelei," ib. 1874. Another son, Jonas Lehmann (born at Mayence Sept. 19, 1865; Ph.D. 1889), is a novelist and dramatic author. Among his works may be mentioned "Thomas Bekket" (1893), a drama, and "Der Günstling des Czaren" (1897), a novel. He is the proprietor of the "Breslauer Zeitung." Gedenkblätter an Rabbiner Dr. Marcus Lehmann, Mayence, 1890.